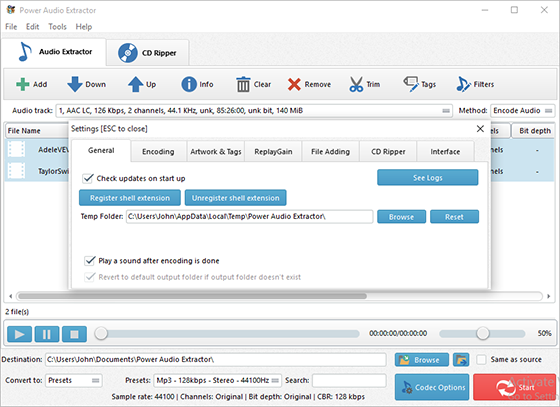 Power Audio Extractor is audio extractor software that can extract audio from video (convert video to audio) and save the audio as MP3, WMA, M4A, OGG, etc. You can now create listening material from for language learning, extract songs from music videos or cut out any audio from a video file. This article will provide some info and detailed steps about How to Extract Audio from Video. 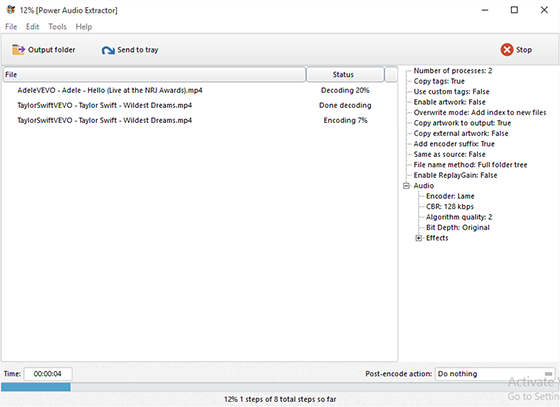 To Extract Audio from Video, download and install Power Aduio Extractor first. Launch the program, click “Add” to import video files – to import one or more files, choose “Add Files”; to import a folder with video files, choose “Add Folder”; to import a folder with subfolder(s), choose “Add Folder Tree”. The you can use “Up” & “Down” to change the order. In “Profiles” menu, select the device you want to play the video on and you can see the details of the profile you select in the “Option Summary” panel at the right. If you know exactly the format your device supports, you can directly choose the output format in “Container” menu. To edit the parameters of the profiles, click “New/Edit” and change the settings in the “Profile Editor” Window. You are allowed to choose the video and audio codec as well as the encoder to use. To change the codec settings, click “Video and Audio Options” and set the options as you want. Choose output path by “Browse” . To download videos from 300+ video sharing wesites, click “Video Downloader” tab and follow the lead of our tutorial: How to Download Videos from Video Websites. That’s all you need to do to extract audio from video.